EnableSafeMode.reg and DisableSafeMode.reg(default) allow the user to switch to and from safe mode in case of any screen update issues. DisplayOn.reg reverses any settings by DisplayOff.reg and will keep screens always on. DontUseEdid.reg can be used if the user is experiencing any issue with the monitor’s native resolution, otherwise Edid is used by default. The following registry files customize screen resolutions and NoResolutionPreference.reg clears out all resolution customization and restore to system default behavior. Sometimes we might ask you to generate a dump file to help us diagnose issues, here is a page with step by step instructions of how to do that. Typically a 800+ MBytes file called WmsShell.DMP will be generated, please zip it so it’s much smaller and easier to transfer, then upload to any free file share services such as Microsoft’s skydrive.live.com and email its link to us. If none of the stations are responding, you will need to remote login from another system via RDP as an administrator to collect the dump file. 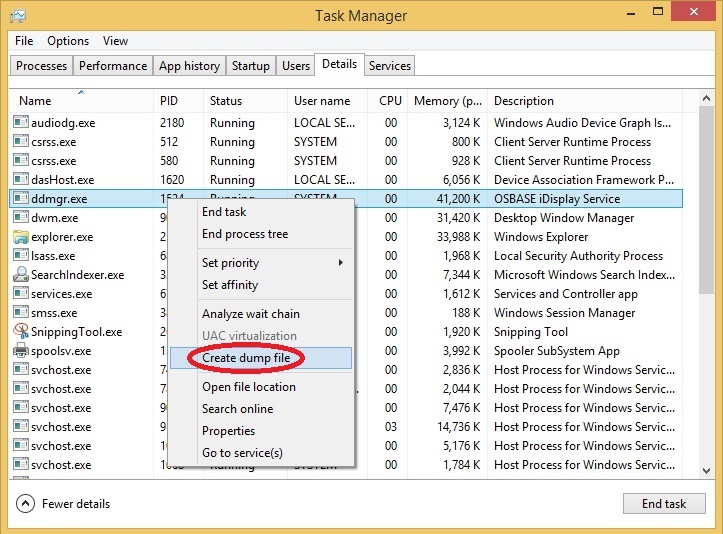 To generate a ddmgr.exe process dump file, please open Task Manager and click Details tab, locate a process called “ddmgr.exe”, right click it and select “Create dump file”. Please find this screenshot for references. To generate a kernel memory dump, please config your “Startup and Recovery” to generate kernel memory dump if it’s not selected already and dump file location, and that dump file location needs to be in a partition with a significant amount free space, otherwise Windows would actually delete it automatically upon next reboot, we have tested with 50GB free space and it seems to work, and make sure reboot if you have changed config. Then go grab this crash tool called NotMyFault from here, and extract all, open NotMyFault.exe and make sure you have a repro of the issue, then you can just click “Crash” to crash the system, after reboot, you should be able to locate the dump file and compress it and unload to a file share location of sharing out. Please find this screenshot for references. Sometimes it might not be possible to run the tool when system is already freezing or not responding, in that case, you might be able to Force a System Crash from the Keyboard. If ddmgr.exe process is not found within Task Manager, that means it’s probably crashed. To capture its crash dump next time, please open registry with regedit and update according to this sample screenshot, a sample registry file can be downloaded from here, more detailed instructions can also be found here at MSDN.